If postmemory relates to how we might remain in thrall to previous generations, and indeed never escape the weight of our own and others’ histories, then a question arises about how anything ever ends. Does suffering endlessly recycle itself? In the words of Suzanne Hommel (in Miller 2011), quoted in Chap. 6, is it the case that whatever happens to one, and whatever one inherits from one’s predecessors, ‘that’s something you’ll cope with all your life?’ The issue here is of what it might mean to bring something intense to an end; and related to this – perhaps even determining the possibility of ever ending something fully – is the question of what we are left with afterwards. One simple fact of psychoanalysis is that we are never free of our conscious or unconscious memories; nor should we really wish to be so, because they give us depth and they focus our subjectivity in relation to the various interpersonal and social features of our lives. Without some legacy from previous generations, we may feel freer, but would we not also be emptier? 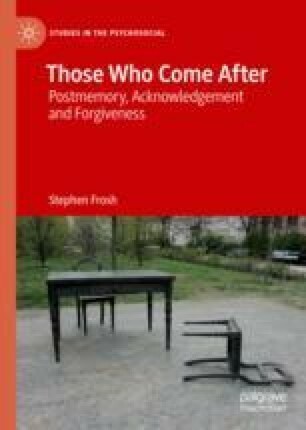 Without being ‘haunted’ by the past, we would lose the benevolent as well as the troubling ghosts; and with this we would lose the sense of ‘identity’ in the way Freud discusses it, for instance in Moses and Monotheism (1939), where he traces the links across generations derived from the sense of a shared history of trauma. More softly and less tendentiously, perhaps, we continue to connect with these histories as ways of locating ourselves; but can we do so without being in a permanent state of mourning for what we have lost?